As you probably know, strawberry is a delicious fruit, rich in essential vitamins the body needs. Granted, there are different types of berries, but strawberries are more common. If you own a guinea pig, you are likely to be considering feeding it with delicious strawberries. Of course, guinea pigs can eat strawberries. But before you head out to the local fruit store in your area or mall to get loads of berries to feed your adorable guinea pig, there are some essential things you must know. In this article, we are going to be looking at some important things you should keep in mind before feeding your guinea pig with strawberries. Are strawberries good for guinea pigs? Irrespective of the type of pet you own, before you feed it with something you don’t normally feed it with, it is wise that you first do some research to find out if the food you plan to feed it with will have a positive or an adverse effect on it. In that light, before you feed your guinea pigs with strawberries, it is essential that you find out if they can eat it and the effect it is likely going to have on them. This leads us back to the question- Are strawberries good for guinea pigs? Well, the answer to that question is yes. And this is because pet expert and vets alike have regarded it as a rich source of essential vitamins that your guinea pig needs to grow quickly and strengthen its immune system. Yes, strawberries are loaded with lots of minerals and nutrients your guinea pig need to grow and develop, but this doesn’t mean that you should feed your adorable guinea pig with it all the time or in large quantities. Doing this will do more harm than good. These conditions can negatively affect the immune system and reproductive system of your guinea pig. See, you don’t have to be alarmed because these conditions can be avoided if you sparingly feed your guinea pig with strawberries. Keep in mind that strawberries are natural acids; they may affect the lips and jaws of your guinea pig if you feed it with it often. Next, we are going to be looking at how to feed guinea pig with strawberries. 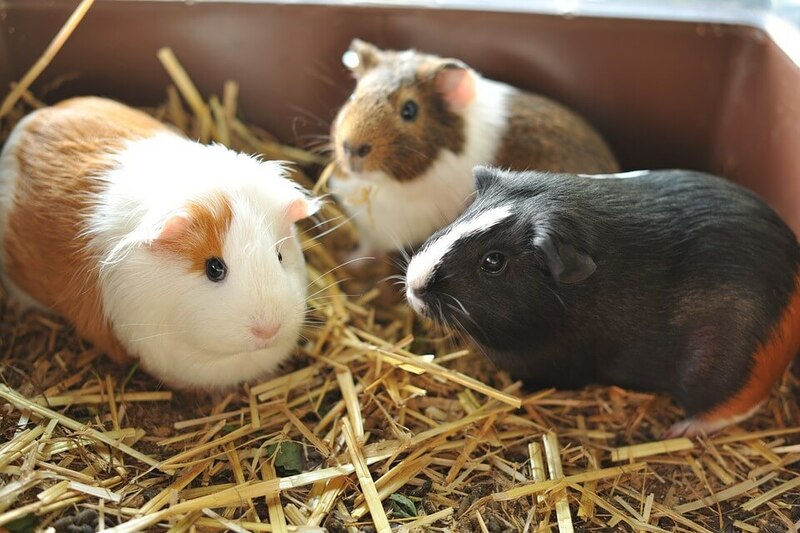 Since the way and manner, you feed your guinea pig may affect its metabolism and overall health, it is wise that you learn the right way to feed it. Don’t load, the cage of your guinea pig with strawberries, just because you want to feed it, as this may increase the odds of them choking on it. If you are new to guinea pigs, it might be difficult for you to picture this happening. Well, look at it this way- If you place a large or medium-sized strawberry into the cage of your guinea pig, chances are it may want to wolf down the whole thing at a go. This could easily lead to choking. To prevent this from happening, you have to cut the strawberry you want to feed it with into tiny bits. Alternatively, you can hold on to the berry as they eat it. Be sure to thoroughly wash the fruit to remove toxic pesticides that may cause serious health issues. Before feeding your pet any food or fruit, it is wise that you do some research to find out the nutrients it contains and so on. In that light, we are going to be looking at some health benefits of strawberries. Just like other citrus fruits, strawberries contain vitamin C, fiber, and manganese. Feeding your guinea pigs moderately with strawberries is undoubtedly going to improve their general health and wellness. Even more, it will strengthen their immune system and make them resistant to disease. The antioxidants found in strawberries can reduce irritation, control blood glucose and improve physical strength and agility of the guinea pig. New studies that were conducted a couple of years ago shows that strawberries can aid digestion and relax the bowel. The bottom line is that berries are an essential part of the diet of guinea pigs. So if you have not been feeding it to your guinea pig, now is the time for you to start. To ensure that your guinea pig stays healthy, you have to feed it with the right food at the right time. As you guessed, guinea pigs like sugary food and fruits like strawberries, banana, and so on because they are sweet. Feeding them large quantities of these fruits is likely going to cause diarrhea and digestion issues as with humans. Below is a picture of an ideal diet of a guinea pig. If you are new to guinea pigs, you might think that you can supply it with anything as long as it is fresh, delicious and it smells nice. That said, you need to keep it in mind that Guinea pigs are herbivores and should not be fed with dairy products like milk, cheese, and so on. It is wise you avoid feeding your guinea pig with cruciferous vegetables like collards, cabbage, and broccoli as they may cause gas. You should also avoid feeding your guinea pig with dried fruits, nuts, seeds, as well as, seeds that come with a husk like sunflower seeds, as your guinea pig could choke on them. Avoid feeding your guinea pig with rabbit pellets, as they don’t contain vitamin C that is essential to the well being of your guinea pig. Keep in mind that rabbit pellets may include antibiotics that may be toxic to guinea pigs.